To some, putting clothes on a dog may seem incredulous. Why would dogs need clothes anyway? It’s not like they can choose which clothes to wear, but then again, being a dog owner, this is one of the perks of being the master and also, making your dog look cute and unique. But then again, clothes on a bulldog? 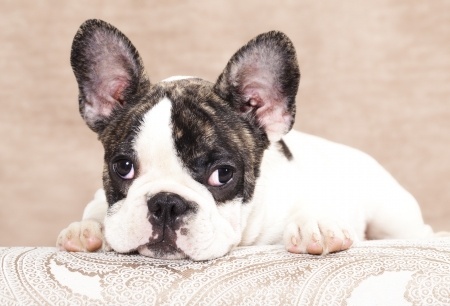 Some of you may be picturing it now and not really getting a good vibe from it, but the French bulldog is not like any other bulldog, although they may look quite the same, with their somewhat fierce look, the French bulldog is quite lovable and more cuddly and friendly looking than the American bulldog. So putting on clothes on a French bulldog can be a viable idea. Besides, shopping for adorable French bulldog clothes can be a lot of fun. But don’t get manic just yet. Whether your shopping online or at your local department store, you hve to mke sure that you are doing it right. Just like shopping for clothes for you or your family, there are many considerations that you have to remember. Firstly, you have to determine the size of your dog. Make sure that the clothes you buy would fit him or her, giving ample room for your French bulldog to move around comfortably. To get the measurements of your dog, calculate the length by measuring from your French bulldog’s neck down to the base of its tail. For the girth of the body, most dog clothes come with Velcro snaps to allow different sizes, but with the French bulldog, they usually have a larger chest, so it might be necessary to specify first what breed your dog is. One important aspect you have to remember though is that a French bulldog does not do well with heat. So if you live in an area where the climate is typically warm, choose loose fitting clothes with a light cloth. This will allow the fabric to breathe and let in cool air to the dog’s body. Accessorize! What is fashion without accessories, right? Be wary though, small accessories and designs, like buttons, necklaces, and tassels can become potential hazards. French bulldogs are naturally curious and would chew anything that dangles in front of it or catches its attention. These things can potentially harm your French bulldog and if swallowed can cause choking or can cause different stomach problems. Maybe you can just stick to some cool shades or a headband. If you have good sewing skills, maybe you can even design and make the clothes yourself. There are a lot of themes you can choose from. But remember, it’s not necessary for you to clothe your dog every day, do it only on special occasions, and if your French bulldog has a problem with wearing clothes, try to familiarize it first with the fact that it would be wearing clothes. French bulldog clothes are not only great for your pet, but also as a gift for your friends which has a French bulldog. So on your next shopping spree, think about your French bulldog as well. Where can I find pajamas that fit frenchies? I have tried ordering but they are always too small in the chest. Good question Luc! Have you tried Amazon?